The problem, really, is that we in the land of plenty don’t actually see water. An overwhelming majority of those aware of the environmental destruction wrought by mountaintop removal coal mining are opposed to the practice. America’s third largest grocery chain, Safeway, announced last week that it will stop selling plastic baby bottles made with Bisphenol A (BPA). Dear EarthTalk: I saw a cover line on a magazine that said, "The next world war will be over water." Tell me we’re not really running out of water! 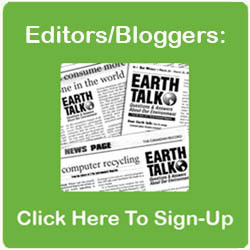 Dear EarthTalk: There has been a lot of news about lead-tainted children’s toys being recalled. Where are these toys ending up and are they creating pollution problems there? Querido DiálogoEcológico: ¿Cuál es la historia con las bombillas LED que se dicen ser aún más económicas en cuestión de energía que las fluorescents compactas? Querido DiálogoEcológico: El aceite de motor usado es un contribuidor grande a la contaminación de nuestros canales y agua potable. ¿Cómo puedo cerciorarme de que no estoy contribuyendo a este problema? There are many exotic variations to traditional table salt—but are there any health benefits? Holiday ideas, from eco-friendly cards to safe kid’s toys to fragrant candles and vegan perfumes, to organic wines and stocking stuffers. In the book aisle, sourcing your stuff, redefining energy, population problems, the green economy and raising eco-smart kids. Indie band The Bowerbirds get back to the land. French designer Philippe Starck creates an inexpensive little turbine fit for mass production.